In this class, babies will experience a variety of movement, sensory, and rhythmic activities to help stimulate, strengthen, and develop both body and mind. 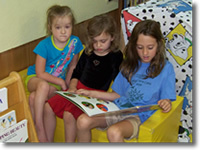 In addition to age-appropriate activities, the class offers a wonderful opportunity to bond with your child. Enjoy singing and dancing and playing together! Movement is an essential part of learning. 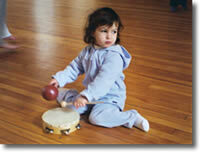 Age appropriate skills are taught to a variety of music. 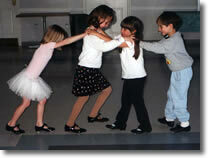 Dance activities emphasize the fun and excitement of discovering the world through movement. Learn movement activities and yoga poses that can be explored at home. Discover new ways of moving as you explore the elements of dance, build a movement vocabulary, and develop basic motor and locomotor skills. Dance skills become more challenging throughout the year and progress with each age level. Through the magic of dance you will enjoy moving to music from around the world, dancing with colorful props, and dancing to stories and poems as you create your own dances. Yoga postures and stories and relaxation techniques are integrated into the class to connect body, mind, and spirit. Have you every heard the words, "Mommy, I want to dance ballet?" 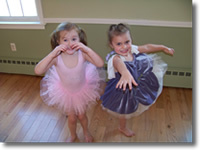 Fundamentals of ballet including French vocabulary are introduced in a creative and fun way. Explore the classical world of ballet as you dance to fairytales and stories of the great ballets. Dance to classical music as you explore movement concepts and learn ballet steps and combinations. Get ready to soar through the sky in your adventures of the imagination. 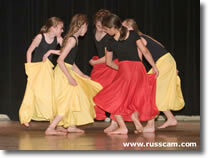 Dance skills and vocabulary are taught with an emphasis on body awareness and confidence in movement. Create beautiful improvisational dances as you learn and explore the tools of dance – technique, design, rhythm, flow, and creativity. In addition, you will develop music appreciation as you dance to the many musical rhythms, learn problem-solving skills, and create solo and group dances expressing the uniqueness of each dancer. Yoga postures and stories and relaxation techniques are integrated into the class to connect body, mind, and spirit. Beginning level tap step combinations, rhythm, and fun. Explore creating rhythm patterns and sounds with the magic of your feet. In addition, play rhythm games, sing songs, play instruments, and dance to a variety of music as you learn about the important connection between music and dance. This class requires tap shoes. Modern and ballet dance technique is formally introduced with an emphasis on self-expression, creativity, and fun. The class is designed to develop rhythmic, coordination, and creative skills necessary in the art of making dances. 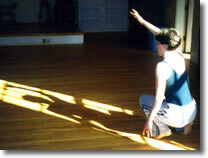 Through yoga, dance exercises and combinations you will develop strength, flexibility, posture, and balance. Then explore moving to a variety of music as you create your own dances. Develop an understanding of dance appreciation as you dance amongst a group of friends who respect and admire each other’s unique ways of moving. Students continue to learn the craft of choreography as they develop dance vocabulary, original movement, and evaluation techniques to express a wide range of ideas. Explore a variety of dance techniques including modern, jazz, and ballet. Explore moving to rhythmic patterns and learn dance combinations as well as create your own compositions to the various styles of jazz, pop, world, classical, new age, and lyrical music. Explore Yoga flows and relaxation techniques. Creative Dance and Yoga for Special Needs is a class designed for children with varying special needs, ages 8+. This class demonstrates the beauty and importance of dance in every one's life. Dancers discover new ways of moving as they explore the elements of dance, build a movement vocabulary, and develop basic motor and locomotor skills, while they gain confidence, learn problem-solving skills, leadership, and self-control. Dancers enjoy moving to music from around the world, dancing with colorful props, and dancing to stories and poems as they create their own dances. Yoga postures and stories and relaxation techniques are integrated into the class to connect body, mind, and spirit. Gently stretch and strengthen your body through yoga postures and dance technique. Explore movement concepts, develop modern dance skills, improvise, choreograph, and let your creative spirit soar in a safe and friendly atmosphere. All levels of experience are welcome. 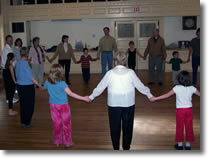 Join us as we play movement games, learn folk dances, and explore the elements of dance together. This intergenerational class gives people the opportunity to dance and play together as a community. What a wonderful way for families to spend time together! Join in the fun! A class designed for dedicated dancers who wish to have the opportunity to perform in the community. Students have the chance to learn pieces of choreography in a variety of dance styles as well as perform their own original works. In addition to attending workshop rehearsals, students are required to attend at least one other dance class at their appropriate age level. Students with at least two years of dance experience or by the invitation of the instructor are welcome to be a part of the Dancers Workshop. No audition required. Children learn best through movement, music, and the arts. 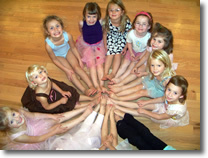 Creative ARTS is a special program integrating dance, music, yoga, drama, and art. Each class there is a different theme inspired by the seasons. The day will begin with a creative dance and yoga class followed by an art project, a small snack provided by the parents, and circle time where we gather together to sing songs, play drama games, and have story time. The class concludes with a circle where we can all appreciate each other and say good-bye until the next time we meet. May be arranged for students who wish to work on dance technique and stretching or strengthening exercises or who would like to learn or work on a piece of choreography.